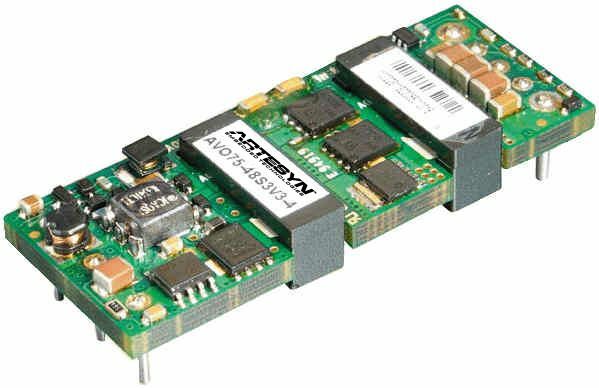 Tempe, Ariz. [4 November, 2014] — Artesyn Embedded Technologies today announced the AVO75 series, new 75 W fully-regulated eigth-brick dc-dc converters that bring high efficiency and thermal performance to cost-sensitive, small space, high current and low voltage telecom network infrastructure applications. The AVO75 series is capable of delivering up to 25 A output current and a single adjustable output between 1.2 and 12 V from a 2:1 wide range input of 36 to 75 V.
Above 92 percent efficiency and excellent thermal performance in an operating range of minus 40 to 85 degrees Celsius makes the AVO75 series an ideal choice to supply power where the highest efficiency is demanded by network equipment manufacters and carriers. For example, these units can deliver their full usable output power from a 48 V input at 55 degrees Celsius ambient temperature with a standard 200 linear feet per minute (LFM) airflow cooling. A range of special features makes Artesyn’s new AVO75 series converters easy to design and deploy, including low ripple and noise, fixed switching frequency, high capacitive load capability, pre-bias start-up capability, output voltage remote sense. They are protected against overcurrent, over-temperature and over-voltage conditions. The converters also have an enable pin on the primary side of the converter and remote-sense features and ouput voltage adjust function on the secondary side. Artesyn’s new AVO75 series converters are available in either open frame or baseplate design in the industry-standard eighth-brick outline and pin configuration, which measures 57.9 × 22.9 × 10.0 mm (2.28 × 0.9 × 0.394 inches). All variants are available with a choice of short or long pins, while the open frame units are available with through hole or SMT terminations. Artesyn Embedded Technologies, formerly Emerson Network Power’s Embedded Computing & Power business, is a global leader in the design and manufacture of highly reliable power conversion and embedded computing solutions for a wide range of industries including communications, computing, medical, military, aerospace and industrial. For more than 40 years, customers have trusted Artesyn to help them accelerate time-to-market and reduce risk with cost-effective advanced network computing and power conversion solutions. Artesyn has over 20,000 employees worldwide across nine engineering centers of excellence, four world-class manufacturing facilities, and global sales and support offices. Artesyn Embedded Technologies, Artesyn, and the Artesyn Embedded Technologies logo are trademarks and service marks of Artesyn Embedded Technologies, Inc. All other product or service names are the property of their respective owners. © 2014 Artesyn Embedded Technologies, Inc.. All rights reserved.